Temperatures exceeding 35 degrees Celsius continued in many areas. I could hardly sleep night before last. It got cool after a thunderstorm yesterday. It's cool today. The Bon period varies in different areas. 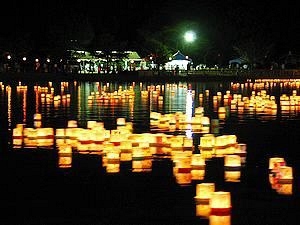 Many areas hold the Bon Festival around August 13th to 16th, some areas around July 15th according to the Gregorian calendar, some areas around the 15th day of the 7th month in the lunar calendar. 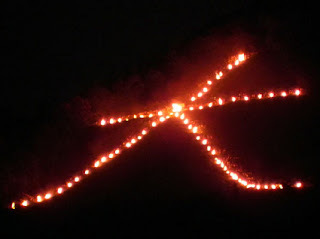 On the night of the 16th, many people light a farewell bonfire to see our ancestors off. Gozan no Okuribi attracted controversy in the country for the pine firewoods in Takatamatsubara(高田松原) this year. The 70,000 pine trees in Takatamatsubara(高田松原) in Iwate Prefecture were swept up by the tsunami on March 11th, and one of them was left alone. The organizers of Gozan no Okuribi planned to burn the pine sticks on which the tsunami victims wrote their wishes. The pine sticks didin't have bark. Some people protested their plan for fear of radiation contamination although raidoactive materials were not detected in the pine sticks. The organizers aborted the plan, but their decision triggered a national outcry. The organizers replanned to burn the firewoods made from another pine logs in Takatamatsubara. However, radioactive caesium was detected in the bark of the firewoods. Their plan was aborted again. Wooden tags made from pine logs in Takatamatsubara are sold to support people in tsunami-hit areas at Zenko-ji Temple(善光寺) in Nagano Prefecture. Those tags don't have bark. Narita-san Shinsho-ji Temple(成田山新勝寺) in Chiba Prefecture plans to burn the peeled pine logs from Takatamatsubara at a rite of cedar-stick burning to grant people's wishes. The tsunami victims are badly affected and worry about causing troubles for these temples. Many people seem to think that the organizers should have burned the peeled pine sticks. I sent off my ancestors by making a bonfire. Toro-nagashi(灯籠流し) is the last event of the Bon festival held in many areas. 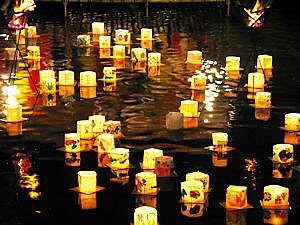 People float paper lanterns down the river or the sea to send off the spirit of their ancestors. 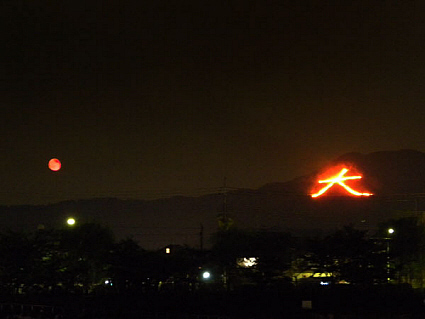 Miyazu Toro-nagashi(宮津灯籠流し) on August 16th in Kyoto has 400 years of history. 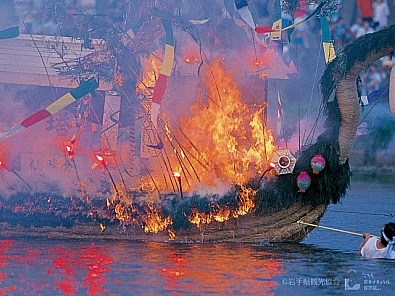 Shoro-nagashi(精霊流し) held on the 15th in Nagasaki is a ritual that the bereaved carry the spirit of the dead with a boat called Shoro-bune(精霊船) or a thatched mat to the terminal point while setting off firecrackers. ﻿ At the first Bon Festival following the death of a family member, the bereaved carry the boat decorated with Bon lanterns and artificial flowers. From the second festival, the bereaved carry a thatched mat on which offerings of flowers and fruits are placed. Nagasaki has a historically close relationship with China, so it has a custom to set off firecrackers at events. 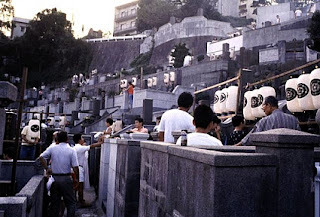 People in Nagasaki let off fireworks in the cemetery during the Bon Period. The boats used to be floated down the sea, but they are carried to the terminal point by the sea and are scrapped there now. The boat with the spirits of the tsunami victims was carried by the survivors staying in Nagasaki this year. Most of the graves destroyed by the earthquake and tsunami on March 11th have still not been restored to their former condition. Their restoration has received a low priority. Some builders tried to restore them before the Bon Festival, but many of them remain destroyed. Survivors visited their destroyed ancestral graves and made offerings of flowers and incense. In tsunami-hit areas, most of gravestones and the ashes of the deceased were swept up. Some survivors planted wooden grave tablets in the grounds of their cemeteries. Everybody lost someone there. People who had lived in the areas designated as the evacuation zone in Fukushima can't visit their family graves. 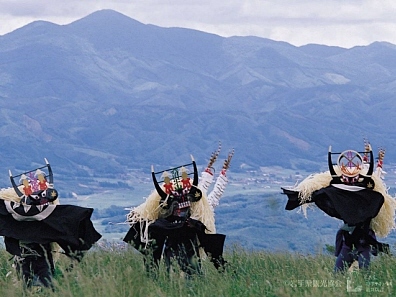 It is said that there are more than 1,000 local entertainments in Iwate, Miyagi and Fukushima prefectures. During the Bon period, some of them were perfromed with help from some cultural organizations although most of their dance gear and dance outfits were swept up by the tsunami. 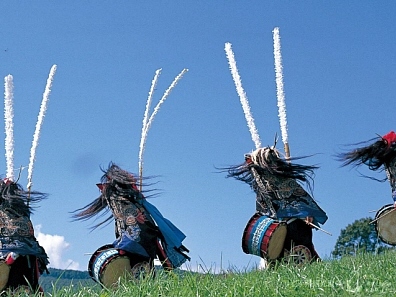 Both Kenbai(剣舞) dances in Tohoku Region and Jangara Nenbutsu Odori(じゃんがら念仏踊り) dances in Iwaki City of Fukushima Prefecture have almost the same roots with the Bon dance. Both dances have several variations in area and are performed to lively music. 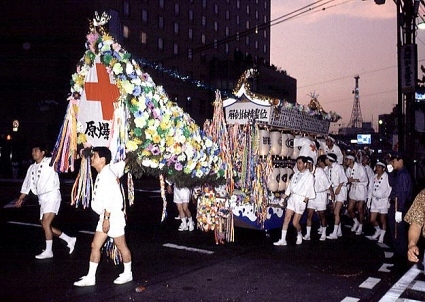 Both dance members perform at the houses where the bereaved hold the first Bon Festival following the death of a family member. 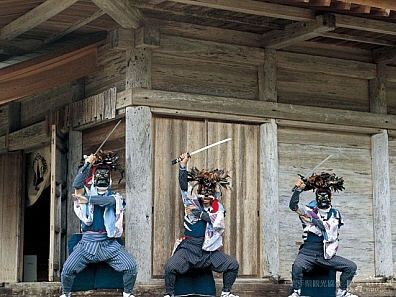 Kenbai(剣舞) literally mean sword dance. 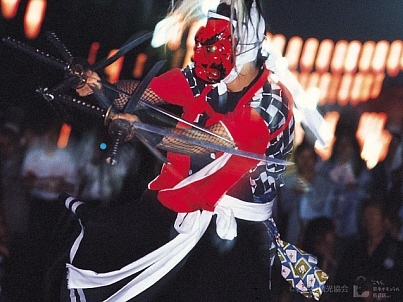 The Kenbai dancers perform wearing a demon's mask or no mask. Girls dance without a mask in some areas. Kenbai dancers also perform at temples. This year, they also did at temporary houses. Nenbutsu means a Buddhist chant. The origin of the word "Jangara" is uncertain. Jangara dancers also did at temples and on the sites where houses stood until March 11th in front of the survivors this year.